Welcome to the Jobs in India For Freshers 2018 page. An immense number of Fresher candidates are deliberately looking for the Jobs in various field such as IT Jobs, Govt Jobs, Bank Jobs, Railway Jobs, SSC Jobs, Walk-in Jobs, Off Campus Jobs, Internship Jobs, Start Up Jobs, BPO Jobs etc. Our main advice for those contenders is to apply for latest 10,000 Vacancies which are available in this post. As the Freshers are increasing and the number of jobs are decreasing. As soon as possible you have to apply for the latest freshers jobs. We have given the most precise information related to Freshers Jobs 2018 in India through this page. So interested job seekers can refer the entire page. As per the latest news, an enormous number of job fighters are hunting for the Jobs in India For Freshers 2018. Those who had completed their 10th, 12th, B.E, Diploma, B.Tech, M.Tech, M.Com, Graduation, Post Graduation, B.Sc, BCA, B.Com can check the recent India Jobs 2018 from this page. Those who are about to passed out or who are about to complete their Graduation or any other qualification can check this page daily to get the instant updates about latest Job Notifications. You can find opportunities both in Government and Private Sectors by following this page often. And also remember we are giving the information here only for the reference purpose. These are officially announced by the concern companies or institutes or Departments. Therefore before proceeding to apply consider checking the official portals twice. On this page, you can find related links to the notification by clicking on which you will be redirected to another page where you can get complete details. 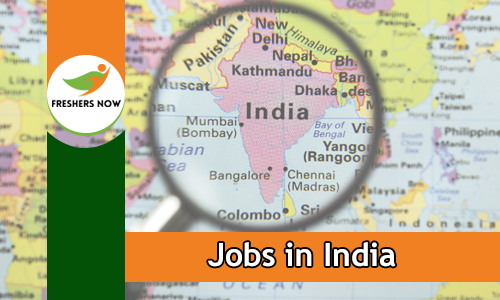 Scroll down and check the much more important stuff related to Jobs in India For Freshers 2018. Also, we have given the information about Fresher Job Openings 2018, Fresher Govt Jobs 2018, Job Vacancies for Freshers in Banks etc. Well, many of the IT Companies are inviting the Fresher candidates. Fresher aspirants if you are searching for the IT Jobs 2018? then we suggest you take a look at this page. So that you can easily get the latest IT Jobs 2018. We have given the list wise IT Job Openings 2018 on our website. So we all that every year many of the IT Companies like Google, TCS, Wipro, HCL, Tech Mahindra, Verizon, Yahoo, Accenture, Cognizant, Capgemini, IBM, Microsoft, LG, Mindtree, Sony etc conduct the walk-ins and hire the best and proficient contenders into their organizations. A large number of Fresher candidates are waiting to begin their career in IT Industry. But they are failing to check the proper details. For the sake of candidates, we have designed the Jobs in India For Freshers 2018 page. Coming to the Govt Jobs 2018 a bulky number of people are hunting for latest and upcoming Government Jobs 2018. For those contenders, many of the organizations are planning to select and already some of the authorities had released the latest Govt India Jobs 2018. All the people have to click on the Govt Jobs link and find out the recent SAIL, NTPC, NALCO, ONGC, BPCL, CIL, BEL, BHEL, IOCL, Vizag Steel Plant Job Openings and apply for the suitable post. Our main advice is to choose the Jobs as per your qualification and apply. Otherwise, the organizations will reject the application forms. So be careful and apply for the Govt Job Openings 2018. Many of the Banks like IBPS, SBI, ICICI, Axis, Standard Chartered Bank, Central Bank of India, HDFC, Allahabad, RRB, RBI, Union Bank of India, Mysore state bank, Syndicate Bank etc are now looking for the candidates. Many of the Banks are about to recruit the suitable aspirants. For that purpose, they have released many openings. As well as some of the Banks are planning to release the recruitment notifications in upcoming months. We suggest to all the job hunters that those who want to develop their career in Bank field can check the latest Bank Jobs 2018 on our site. Contenders can check the entire Railway Jobs 2018 information on our website. Railway Jobs are the best career growth Opportunity for the candidates. Aspirants if are tired of searching for Railway Jobs 2018 in India then no need to worry because recently released recruitments are available on our website. Hence a huge number of job seekers are in the race for Railway Jobs 2018. Therefore there will be heavy competition for RRB Jobs 2018. Without late apply for Jobs in India For Freshers. Almost all the contenders Railway Jobs is the dream. To fulfill your dreams many of the recruitments are available. So apply before the closing date. Aspirants who are willing to get a job in Government of India can choose the SSC Jobs 2018. The Staff Selection Commission had released an enormous number of job openings. So interested people can refer the latest SSC Job Openings 2018 from our website. If you are eligible then apply on or before the closing date. Because a bulky number of job fighters are in a race to apply for Jobs in India For Freshers 2018. There is so much competition, therefore, to grab the chance all of them check the details and apply through our website. Every year many of the Walk-in Drives are conducted by various companies. If you are one of them want to participate in the walk-in drive then you can get the wonderful news on our site. Because we have given the latest Freshers Walk-in Interview Drives 2018 on our site. Also, the competition for the Walk-in Jobs is very heavy. So keep in mind and apply for the interested Walk-in Jobs 2018 through our website and attend for the jobs. Also, we have given the location wise Walk-in Openings 2018. Interested one can pick their location and apply. Check the Off-Campus Jobs 2018 through our site. We have given the Mindtree Off Campus 2018, Amdocs Off Campus 2018, HP Off Campus 2018, LG Off Campus 2018, Yahoo Off Campus 2018, Microsoft Off Campus 2018, Google Off Campus 2018. Many of the Fresher candidates are waiting to make their career in IT Field. For those contenders, we have given the Off Campus 2018 Jobs. Internship Jobs 2018 are the most trending jobs in India. Most of the students are choosing the Internship Jobs. For the sake of candidates, on our website, we have given location wise Internship Jobs 2018. So interested contenders can choose their location wise and apply before the given dates. Many of the startup companies are eagerly waiting for the Fresher students. many of the startup companies show interest in taking fresher candidates who are having talent. We have given a list of recent Startup Jobs 2018 in a tabular format on our website. So contenders can check the list and apply. Check the latest BPO Jobs 2018 on our website. Also, on our website, all the contenders can get the current BPO Job Openings 2018. We have tried our level best and gathered all the details stuff. So without delay, refer the entire information and apply for Voice and Non Voice BPO Jobs 2018. Keep visiting our website www.freshersnow.com on regular basis and find out the more information about latest jobs in India.